Amazingly, there are apparently people out there who actually enjoy doing laundry. They say doing the laundry gives them the deep satisfaction of revitalizing their family’s dirty and unwearable garments into fresh, neatly pressed pieces of clothing that play an essential role in the daily lives of each family member. These laundry lovers also enjoy the repetitive, methodical nature their laundry work requires and find it to be a relaxing routine that allows for quality thinking time. If any of this seems like a completely foreign concept to you, we suspect you’re in the vast majority of people who wish their laundry chores could be a lot less tedious and time-consuming. While you may not share a similar level of enthusiasm for doing this unavoidable part of your housework, it’s a good bet these laundry lovers have paid considerable attention to how well their laundry room organization functions. When your laundry room is set up to be a more functional space when it comes to organization and storage, laundry duty becomes a more streamlined and efficient process. That can make it a task that you may not necessarily come to love, but one that you can enjoy just a little more. After all, we spend a lot of time in the laundry room. The average American family does about 8 loads of laundry per week. That adds up to hundreds of hours each family spends in the laundry room over the course of a year. Get one of your home’s hardest working spaces working that much harder for you by using these 7 laundry room organization ideas and tips. If your laundry room is using outdated cabinetry, modernizing the space with custom cabinets is a great way to make your laundry room organization function at a higher level. A family of four or five can require a large number of laundry supplies, such as detergent containers and pods, fabric softener, bleach, dryer sheets, and stain removers. That’s a lot of items to store and keep organized. Create just the amount of storage space you need for everything with cabinets custom-built to the depth and width you require. If space allows, the laundry room is also ideal for adding storage space for things in your home other than laundry supplies, such as linens or out-of-season clothing. Add shelving and storage cubbies for extra storage space for items like laundry baskets and decorative jars to hold your clothes pins and detergents, which adds a little character to the room. New storage cabinets are a worthwhile addition to any laundry room. Add some pullouts to those custom cabinets, however, and your laundry room organization gets even easier to manage. Take the laundry room closet pictured below. The bottom pullout shelves make it much easier to locate and access stored items, whether it’s paper towels, toilet paper, laundry supplies, or the home’s cleaning supplies. Drawer pullouts can also be added to your cabinetry to give you extra drying racks or a space-saving ironing board. Pullout folding counters and pullout valet rods are another laundry room organization option. In addition to the functional benefits of cabinets that are custom-made to fit your space and needs, there are also aesthetic benefits. With beautiful high-end finishes and decorative touches like stylish contemporary hardware, new cabinetry with extra functionality using pullouts can provide the sorely needed modern touch your laundry room has been lacking for too long. Pullout shelves in a laundry room closet make stored items more accessible. Another of our laundry room organization ideas with an eye toward maximizing your storage space is to utilize more of your room’s hidden storage space. A lot of homes have underutilized storage space underneath the bathroom, kitchen, and laundry room sinks. Add an under sink organizer to put that small space to better use. Considering its low location and the space’s typically poor visibility, use a more convenient pullout under sink organizer. If your washer and dry are installed on pedestals, take advantage of the drawer storage space they offer. Another way to add some hidden storage space to a room, while also getting multi-purpose functionality, is with a bench that has underseat storage. Waiting for a washer or dryer cycle to finish is part of the laundry ritual, so why not do it on a comfortable bench that can also store a few things? All of this hidden laundry room storage, in addition to storing things out of sight behind your cabinetry doors, helps to create a space with less visual clutter. Studies show that people working in a room with little to no clutter tend to be more productive. That includes the laundry room. Having enough hanging space in your laundry room is a key part of keeping it organized. If you have ample hanging space, you won’t need to clog up your countertops with items of clothing that need to be ironed or folded. Being able to take items fresh out of the dryer and hanging them in your laundry room’s designated hanging spaces minimizes wrinkling and extra ironing work. For more delicate clothing that needs to be air-dried, any of these hanging laundry room organization accessories and solutions are also ideal. Laundry rooms that aren’t designed to handle all of your laundry duties only add to the amount of time the task takes. For example, say your laundry room doesn’t have a folding station or enough counter space to sort and fold your finished laundry. That means you’ll need to move everything to another room and deal with it there. In the meantime, things will get wrinkled and the whole process just takes longer than it should. A folding station should be part of any laundry room design that aspires to be as functional and as organized as possible for its users. A workable folding station simply requires having a comfortable amount of flat space to handle your folding duties. That can come in the form of your laundry room countertops, an island countertop, or pullout counter space. If you have a small laundry room, the tops of your washer and dryer can also be used as a folding station if they’re at comfortable enough height. It’s highly practical to have laundry hampers built right into your laundry room’s cabinetry. Having multiple laundry hampers located right where you do your laundry allows you and the rest of your family to keep dirty clothes sorted by colour. Laundry hampers with removable, carryable bags could also be added to your home’s bedroom closets to keep dirty laundry more organized. You also won’t need to deal with unpleasant odours from dirty clothing. Get the dirty clothes sorted at the source where they’re coming from and you’ll spend less time sorting (or picking them up off the floor) when laundry day comes. Add built-in laundry hampers to your bedroom or laundry room. They keep dirty clothes sorted and more organized. Combine a couple of these laundry room organization ideas by creating a multi-purpose work surface that also provides room for storage – a laundry room island. For larger laundry rooms, the addition of an island makes a lot of sense. The open space in the middle of a larger room can be put to good use with an island. It may very well become the anchor of your laundry room’s design, where you find yourself spending the majority of your time when tackling your laundry duties. A laundry room island with a sturdy, yet stylish countertop can be used as your main folding and sorting area. Some of those aforementioned handy pullout features in your custom cabinetry (like an ironing board and laundry hampers) could be incorporated into a laundry room island. An ironing board, in particular, is ideal for a laundry room island and the counter space it provides for handling your freshly laundered garments. Like washing the dishes or cooking, laundry duties are something that never lets up. Laundry day doesn’t have to be something that makes you regularly shudder, however. Adding some modern laundry room organization amenities and upgrades can save you time and make your workspace a little more pleasant to spend time in. 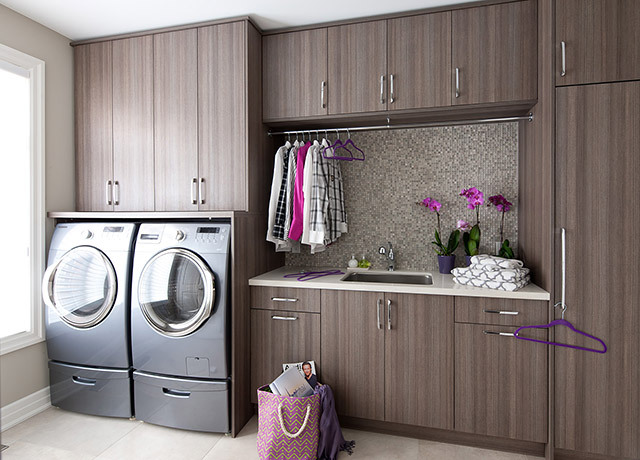 Find out how Organized Interiors’ smart and stylish laundry room designs can benefit your home and family. Book a free in-home design consultation with us today. A large laundry room loaded with all the amenities can make dreary laundry tasks easier to face. But what if you don’t have the luxury of having ample room to accommodate this hardworking space in your home? Doing a task that few people enjoy in a cramped, unappealing space that lacks functionality only makes you less anxious to tackle those laundry chores. If you’re looking to makeover your small laundry room, you’ll need to get creative and implement some smart small laundry room ideas to get the most out of your compact space. Size isn’t the be-all end-all when it comes to how efficient your laundry room is. A smaller laundry room that utilizes its space well and includes smart storage and organization systems can be surprisingly effective. In fact, it can even function better than a much larger laundry room that wastes storage space and is poorly laid out. Use these nine small laundry room ideas to help you get more from your compact laundry space. Any small room needs to utilize all of its available space and a small laundry room is no different. You’ll want to carefully consider how every square inch of the space can be useful to you. Be mindful not to overload your laundry room with too many small laundry room ideas and additions, however. You still need it to be functional and not to detract from your home’s décor if possible. Floor-to-ceiling custom cabinetry maximizes storage space in a small laundry room. Be sure to utilize as much vertical space in your small laundry room as possible. Go as high as you can with shelving and cabinetry, but not so high that it’s too difficult or unsafe to reach. A small step stool can give you a few more inches of reaching height for those upper storage areas. Switching to a washer and dryer that stack also helps to optimize the vertical space in your laundry room. Another one of the small laundry room ideas you can use that saves space is to get an all-in-one laundry appliance that washes and dries. Another way to gain a little extra storage space is to use pedestals underneath your washer and dryer. Pedestals have a handy drawer that can give you extra room for keeping laundry supplies that are easy to access. Their primary purpose of pedestals is actually to boost the height of your appliances by about 10-15″. This can make it easier to load and unload machines. Not every laundry appliance can use a pedestal, so make sure any models you’re looking at can accommodate them. Adding counter space in your small laundry room gives you a valuable surface that can be used for tasks like folding and sorting laundry or for extra storage. The countertop can be added above your appliances so no space is wasted and be customized to complement the rest of the laundry room’s décor. Keep in mind that it is less practical to add a laundry room countertop above your appliances if you’re using pedestals. Also consider that adding a countertop above your machines will only work for front-loading appliances. 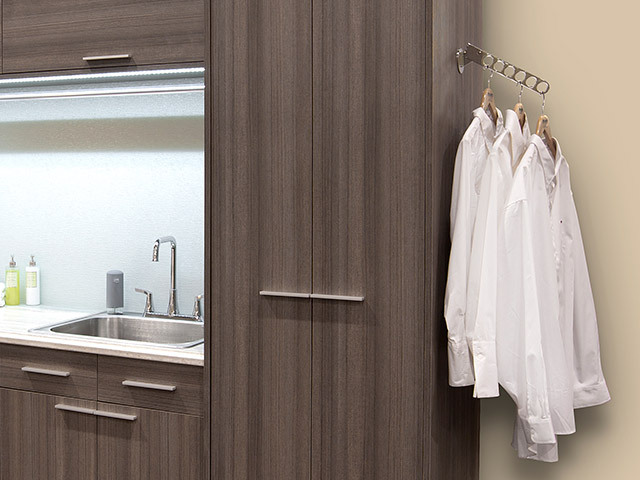 A custom design for your laundry room’s cabinetry will ensure that it’s made to precisely fit within your small space. 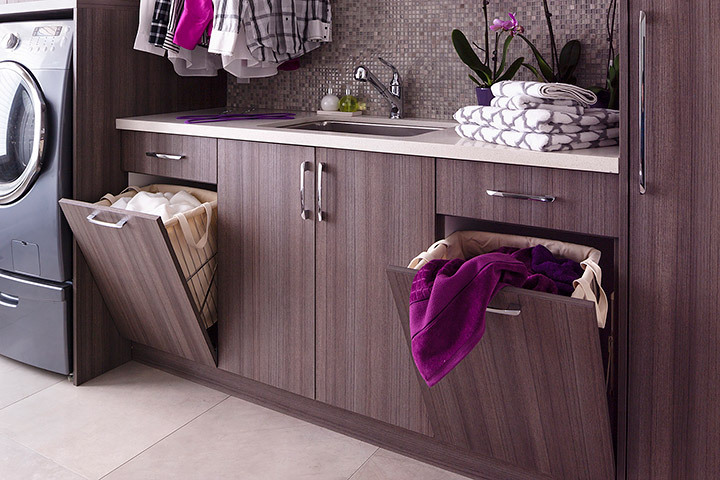 This ensures that the storage space and functionality in your small laundry room is maximized. 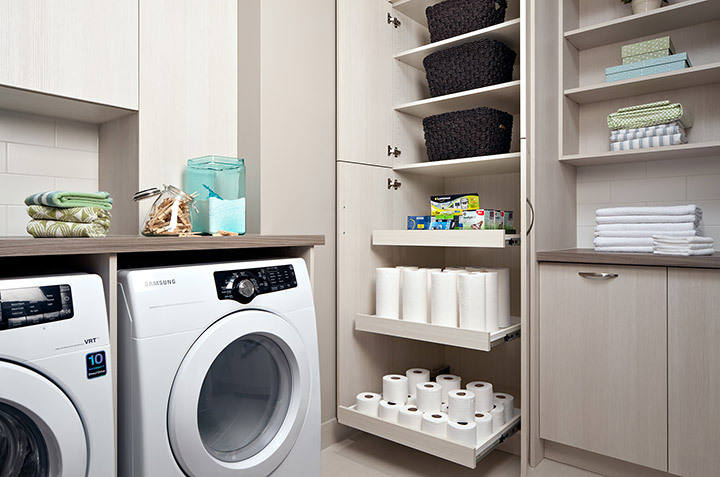 All your laundry supplies can stay well-hidden, yet easily accessible and organized. Along with the built-to-fit benefits of custom laundry room cabinetry, the ability to customize also gives you the freedom to have your laundry room’s décor look the way you want. 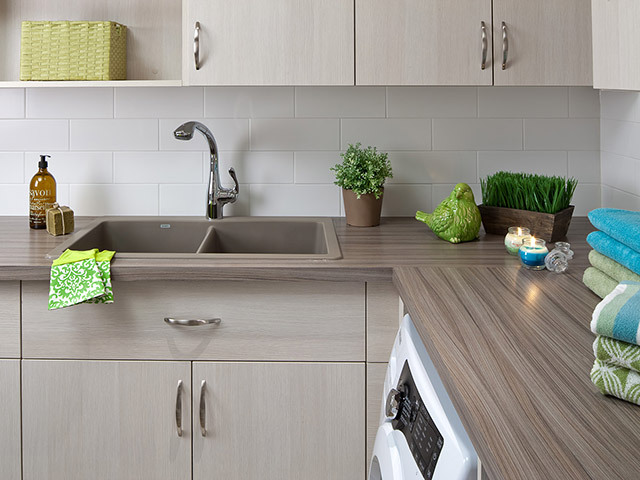 Even though your laundry room may be compact, perhaps you have enough space to add a small multi-purpose island. A laundry room island can also add extra functionality to the space as a folding area and storage space. Hidden built-in laundry hamper pullouts and a built-in ironing board could also be included in the island’s design. Some of the dead space your small laundry room may have can be utilized for storage. If you have open space on top of your cabinetry, store laundry baskets that can hold loose items and supplies. Tight corners and awkward spaces can have shelving added and shallow floating shelves can be installed above your appliances if they’re not stacked. When space is at a premium, having small shelves that can store even just a couple of detergent containers can be quite useful. Using your room’s underutilized storage space includes adding laundry room accessories and decorative hardware for extra functionality. Hooks, a retractable valet rod, and an adjustable four position hanger provide extra hanging space for laundry or supplies. And they all take up very little space, which gives you lots of flexibility when deciding where to use them. If space allows, add an extra hanging rod (even a short one). Accessories like an adjustable four position hanger can be added almost anywhere in a small laundry room. The last of our small laundry room ideas involves adding a folding station that folds up. Being able to fold your laundry when it’s toasty warm right out of the dryer (instead of having to move it somewhere else to fold) will minimize wrinkling and save time. This space-saving idea provides a useful workspace and folds up and out of the way when it’s not needed. It’s a clever solution for laundry rooms that can’t incorporate an island or any counter space (or enough counter space) into the room’s design because of space limitations. Hopefully these small laundry room ideas have shown you that a compact laundry room space can still provide you with a high level of functionality. Organized Interiors can work wonders with laundry room spaces both big and small. Schedule your free in-home design consultation with us to discover what clever laundry room ideas our designers can come up with for your home. How long has it been since your laundry room had any sort of meaningful update to its appearance? And replacing a washer and dryer don’t count! There’s a good chance it’s been quite some time. But why is that? Laundry rooms are used at least once a week by nearly all families and oftentimes much more than that. 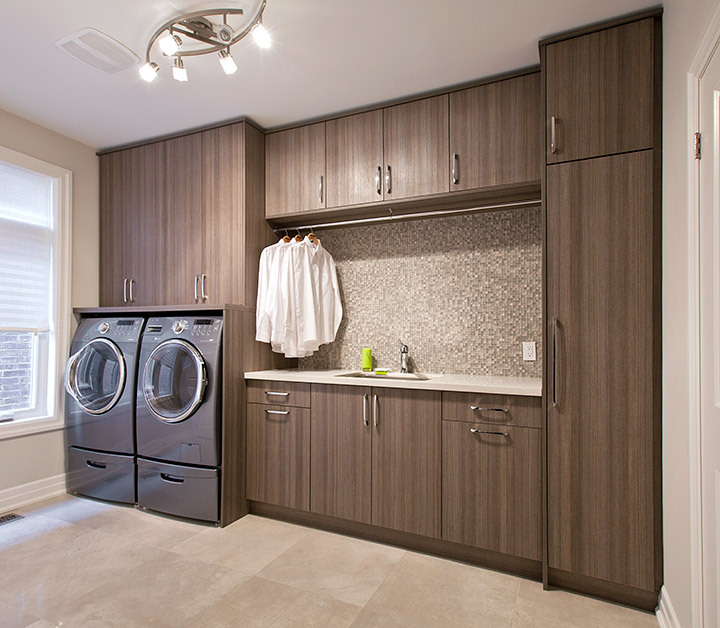 For a room that’s used so frequently, the laundry room has traditionally been considerably overlooked in terms of attention to its appearance and functionality. If it’s been more than 10-15 years since your last laundry room (or mudroom) remodel, it’s time to modernize it. And if your laundry room has never even been properly finished, there’s even more reason to give it some much-needed attention. Use these seven smart laundry room ideas to transform this underappreciated space in your home. Maximizing storage space in your laundry room without sacrificing aesthetic standards calls for high quality custom cabinetry. Organized Interiors specializes in finely crafted custom cabinetry that’s manufactured in-house, to the exact specifications your home requires. Keep your laundry supplies and other belongings stored out-of-sight and organized in our beautiful laundry room cabinetry systems. Open shelving storage solutions are also available for items you want even more easily accessible. Customize your cabinetry with a wide variety of options for decorative hardware, configurations, accessories, and wood finishes. Laundry tasking generally becomes a little easier with an adequate amount of counter space at your disposal. Whether it’s having a surface to set down the laundry supplies you’re using or for sorting and folding clothes right out of the dryer, extra counter space can come in very handy. Our design experts can work with you to include countertops within your laundry room’s custom cabinetry design. Good laundry room ideas should make your laundry experience more efficient and helpful. You’ll enjoy the practicality and space-saving benefits provided by pull-outs and other laundry room accessories. Pull-out racks and drawers in a laundry room save space and have many uses. You can use them to make supplies easier to find. A pull-out drying rack, for example, provides an extra storage option for drying clothes, as do adjustable valet rods and hanging rods. Pull-out ironing boards conveniently only take up laundry room space when they’re needed. One of the smarter laundry room ideas to consider is built-in laundry hampers. These hampers are incorporated into your custom cabinetry to maximize space and keep dirty clothes organized. Add extra hampers to make sorting easier. You can also add built-in laundry hampers to your bedroom. The removable hamper insert features handles for easily transporting your dirty clothes to the laundry room. Improving the lighting in your laundry room doesn’t cost much and can make a world of difference. Laundry rooms commonly lack decent lighting, which can make a joyless task like doing laundry feel even more arduous. Basement laundry rooms lacking much natural light are particularly uninviting. Change the atmosphere by adding ambient or accent lighting. Task and under-cabinet lighting in more frequently used areas of the laundry room also make work easier and improve the atmosphere. If you’re updating your laundry room’s decor, you can’t ignore the flooring. Since laundry room floors are prone to moisture, ceramic tile or vinyl flooring are good options. 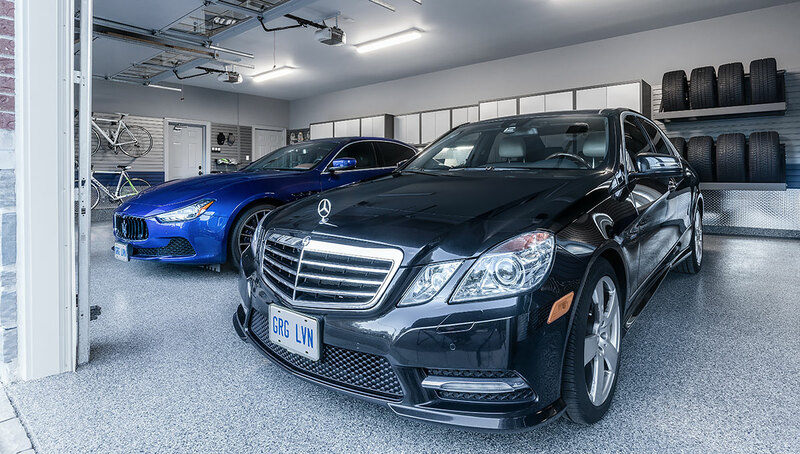 You may also want to consider using interlocking PVC floor tiles from Garage Living. They’re easy to install, durable, and are available in a number of colour combinations to fit your room’s decor. You could add an inexpensive white plastic laundry tub to your laundry room, but think a little bigger if your budget allows. A deep stainless steel sink complemented with a stylish faucet looks much nicer! Give your laundry room’s look a thorough refreshing by addressing the areas in which its lacking. Schedule your free in-home consultation to discuss these laundry room ideas and more with one of our design experts.